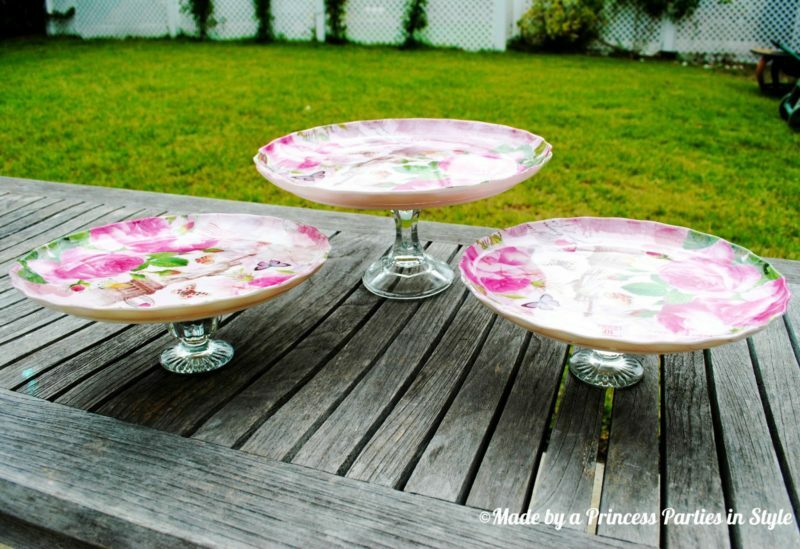 When my friend Roni of Roni’s Sugar Creations texted me a picture of these beautiful Parisian floral platters she saw at her local 99 Cents Only store I knew exactly what I was going to do with them. I got right in the car and headed over to my own local store and picked up every last pink platter and plate that was left! 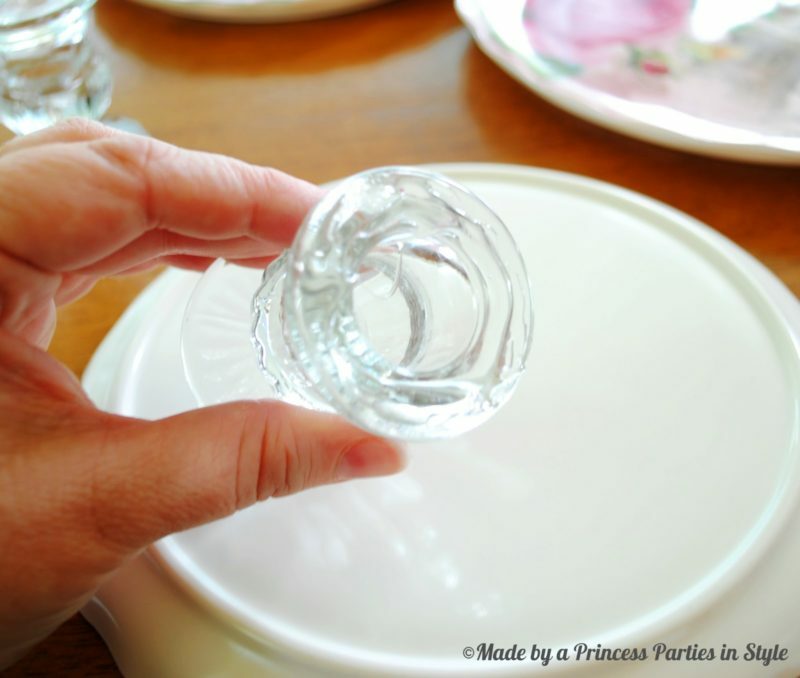 This craft is really easy and best of all very inexpensive. 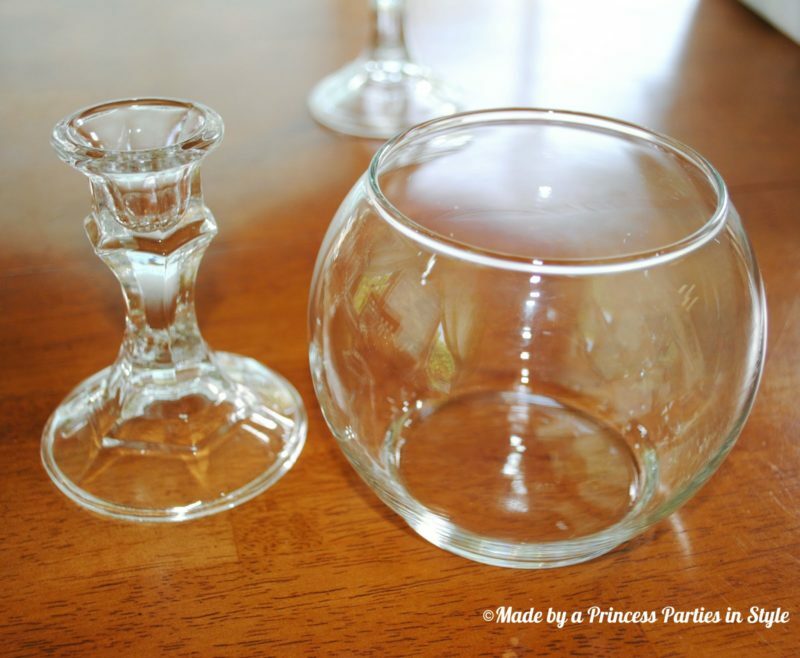 All you need are some pretty platters or plates, glass candlesticks, and a couple sets of the small candlesticks (these come in a package of 2), and a tube of E6000. If you would like to make the pedestal bowls pick up a few more candlesticks and some glass bowls in the votive section. Here is a picture of my supplies for the dessert tier. I wanted to make this three tiered but you don’t have to. The beauty of this project is you can create whatever you need for just a few dollars. Grab your tube of E6000 and create a ring of glue on top of one of the smaller candlesticks. Place in the center and hold down for several seconds. Set aside and don’t touch it for at least a half hour. It takes a little while for this glue to harden and hold but once it does it bonds really well. Put together all of your tiers and just let them dry for a bit. While your tiers are drying you can make some pedestal bowls. I made two big ones and two smaller ones. I got these candlesticks and bowls from Dollar Tree. 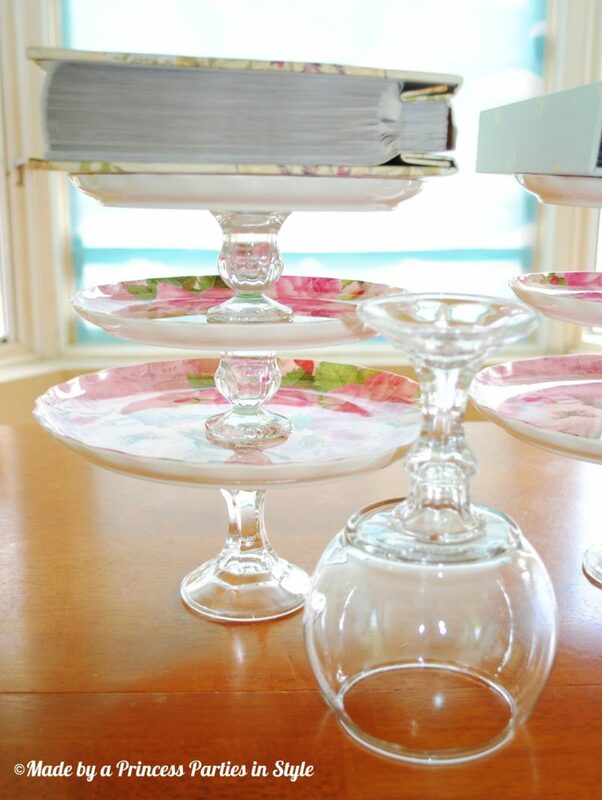 Once I had all my pedestal bowls created I put my dessert tiers together and laid a photo album on top for weight. I would recommend not moving or touching them for 24 hours. Just let them set and they will be ready to use for your next party! I have big plans for these babies. 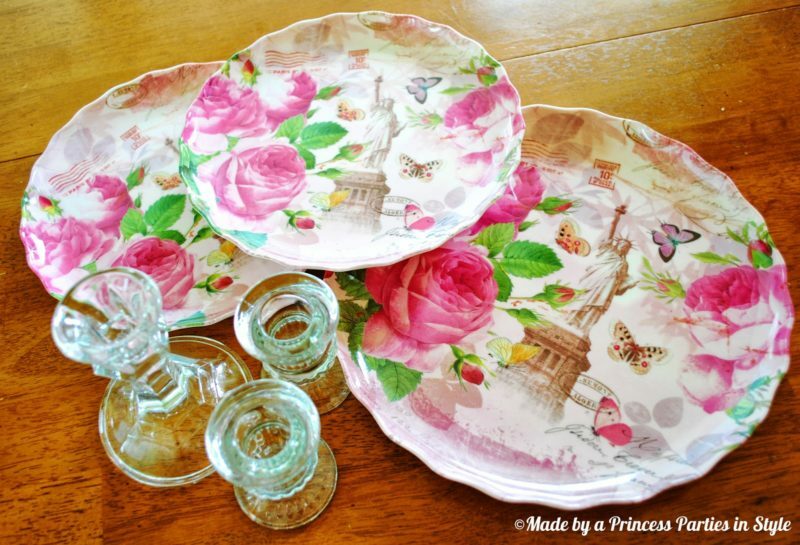 I am hosting my annual Favorite Things Party this summer and the theme is Marie Antoinette’s Picnic in the Garden…these are going to be perfect! You could easily use these for a bridal shower, baby shower, dessert table, candy buffet, or birthday party. 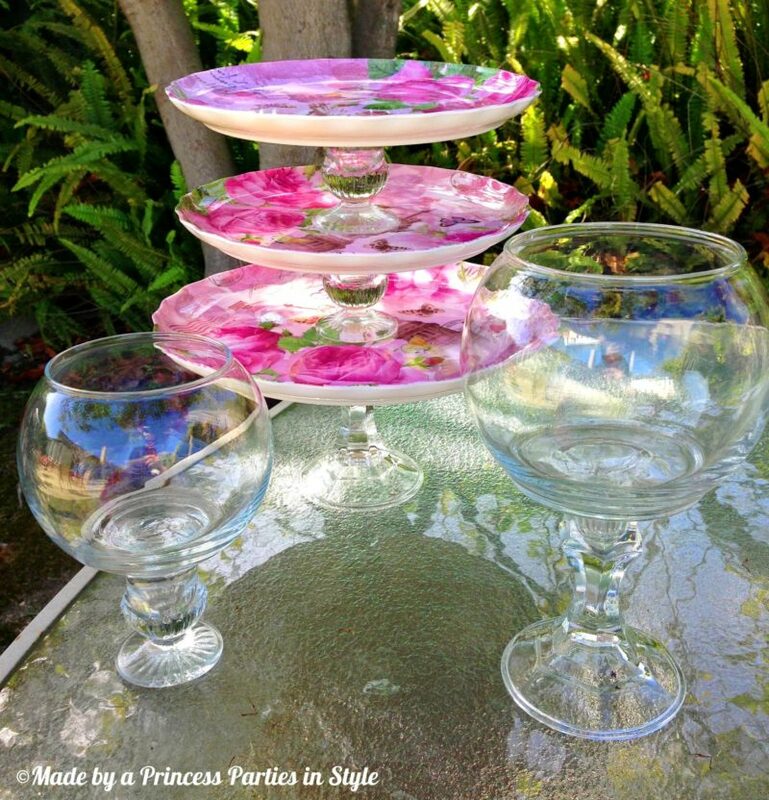 I hope you enjoyed this super easy and affordable DIY 99 Cent Store Dessert Tier and Pedestal Bowls tutorial. I would love to see some of your dollar store ideas and crafts!